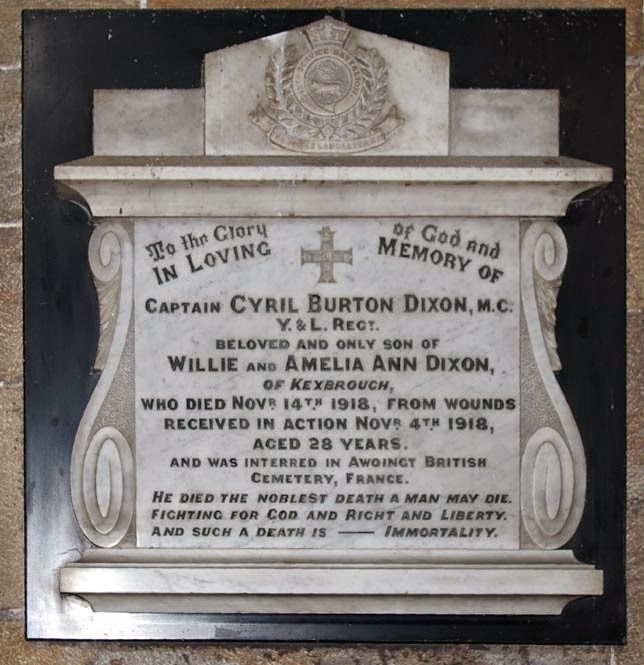 To the Glory of God and / In Loving Memory of / Captain Cyril Burton Dixon, M.C. / Y&L Regt / Beloved and only son of / Willie and Amelia Ann Dixon / of Kexbrough / Who died Novr 14th 1918 from wounds / received in Action Novr 4th 1918 / aged 28 years / and was interred in Awoingt British Cemetery, France. / He died the noblest death a man may die. / Fighting for God and Right and Liberty. / And such a Death is - Immortality. Cyril is buried in the Awoingt British Cemetery in France and commemorated on the Commonwealth War Graves Commission website.